Today is quickly turning into another whacky day in the blogosphere. My WordPress dashboard showed a link from Edward Sebesta’s Anti-Neo-Confederate blog. When I clicked over I was shocked to find that I am referred to as a “white nationalist.” Imagine my surprise. Apparently, Ed is not happy with my recent post in response to Jamie Malanowski’s editorial on the changing of the names of military bases. First, he can’t even spell my last name correctly, but how he arrives at white nationalist based on this post is anyone’s guess. I’ve been called plenty of things over the years, but this is the first time that I’ve been referred to as a white nationalist. Sebesta is, indeed, a strange character. This leaves me to wonder whether the guy has a few screws loose. 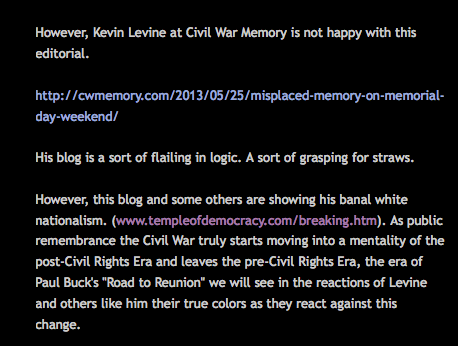 Don’t be shy, Kevin Levine, you’re also mentioned in his “Texas Frontier Heritage” post. I will have to go check that out. In his most recent post, Ed refers to James McPherson as John McPherson. This seems to be a problem for Ed. This really is funny. At least he did not call you a Southern Nationalist. then you would have to really worry. By the way, I am not a Southern Nationalist either. Kevin, He did not even spell your last name correctly. Maybe he was thinking about some other guy. Don’t give him another thought. The link to my blog gave it away. So Carl Roden and Ed Sebastia agree on something….Gotta love the internet. I know he must be upset about me calling him out on occasion, but this kind of silliness only serves to make Sebesta look like a fool. I’ll agree with ya there. I’ve heard about Sebesta from this blog every now and then, but does he have any real clout? I have yet to find anyone taking him seriously, but I am admittedly not looking very hard. James Loewen took him seriously enough to co-edit a book of documents on the Lost Cause. Somehow this guy has managed to publish an edited collection with a university press. I rarely think of you as a White Nationalist. I don’t think of your twisted ideology as encompassing all white people. You’re more of a Southern Revanchist longing for blood and the naming of parks. I could be wrong though. Just my two cents. You mean other than to string you up? No. Maybe he just wants to give you street cred with the SNN. They occasionally cite my articles about the Know Nothings to make the point that “The North was worse than the South.” Drives up my hit count at least. Ed is simply incapable of acknowledging anything remotely gray. It’s all very strange. You left out the “banal” part. I say that not because I regard you as banal, but because to Mr. Sebesta there would be a difference between a white nationalist and a banal white nationalist. The former is overt and the latter (if I understand his writings) is reserved for those who hold those views as part of their broader ideology without entirely understanding the worst elements of their own beliefs. So, if it is any consolation, he’s not saying you’re a card carrying extremist, just a bourgeois dupe. If you look at Sebesta’s 2009 letter to President Obama regarding the annual wreath laying at the Confederate monument at Arlington Cemetery you’ll see it is cosigned by a long list of noted (and not so noted) academics who work in the field of historical memory. If you have to be insulted, at least it was by someone who has been peer reviewed and is held in good repute within his field. Seriously, though, you presented a nuanced view of a complex subject and rather than engage you in discussion Sebesta labelled and dismissed you. I suppose in some circles that’s what passes as discourse these days. Yes, I understand the difference. Either way, it is the mark of an undisciplined mind. I don’t understand the idea that “we” have named these military bases. We call them Hood, Bragg, Polk or whatever, but we did not name them. I agree with you on the Malanowski article. He is expressing a narrow minded personal and political opinion. A number of progressive political blogs have commented on the Malanowski article, like for example Josh Marhshall’s TPM blog. If you’re not with them on renaming the military bases, you’re a racist. That’s where these arguments are heading. It’s in fact already headed there with regards to you and Edward Sebesta. Edward Sebesta reminds me of the Soviets and others who just had to re-name everything, that was named well before their time, so that it would fit their particular weltanschaung. By the way, if you didn’t see this, here is a brief article by Dr. Charles Cogan that counters Malanowski’s argument. I agree with you about the “undisciplined mind” part. It takes discipline to read what someone else is saying and organize cogent arguments to rebut the points made. Had Sebesta resorted to the simple expedient of reading your blog over time with any degree of intellectual curiosity he would not have been able to label you as something you are surely not. What he could have done was make an interesting case for why you are wrong but he chose not to, which certainly detracts from his credibility. The more interesting point is that likely Sebesta has read your blog over time, knows that you are not in any sense, banal or otherwise, a white nationalist and simply doesn’t care that what he is saying is inaccurate. There is an element of the school yard bully in those who would foreclose argument by hurling incendiary labels like bricks through windows. We’ve lost something in this country in the past twenty years or so, and that is respect for people who disagree with us and ideas we disagree with. Whatever the topic is we manage too often to reduce questions to absolute right or absolute wrong. When we do that we stop talking to each other and begin talking at each other, which no matter your viewpoint is (I think) anti-intellectual. (Or at least, banal-pun intended).